DIY Hot Chocolate On A Stick, easy recipe for homemade hot chocolate cubes that make a fun homemade holiday gift! 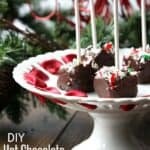 If you’re looking for a quick last minute Christmas or holiday gift, this recipe for DIY Hot Chocolate On a Stick is for you! I love quick homemade DIY kitchen gifts including my Homemade Ranch Seasoning and Homemade Taco Seasoning which would also make great homemade holiday gifts! But if you’re looking for something more on the sweet side, give these Hot Chocolate On a Stick a try! My kids loved helping with these! To start, mix together heavy cream and sweetened condensed milk (not evaporated milk) in a small bowl. Microwave the milk and cream until really hot and bubbly, about 30 to 60 seconds. Pour the hot milk and cream over the chocolate chips and stir until smooth. I used semi-sweet chocolate chips but you could use milk chocolate, dark chocolate, or bittersweet. At this point you could also add some flavorings or extracts. BUT be ver careful with your flavorings and extracts because some that contain things such as water, may cause your chocolate to seize and get clumpy. If you’re unsure, I’d suggest testing on a just a little chocolate first. Spoon or pour the melted chocolate into a silicone ice cube tray. I strongly recommend a silicone tray and not a plastic tray, because the chocolate will pop right out of the silicone. I used a 1-inch cube tray but you could use any size. I also used a small ice cream scooper with a trigger to get the chocolate in the tray which worked great! I added my sticks at this point to each cube, but if the sticks keep falling over, you can refrigerate the chocolate in the tray for a little while first for the chocolate to firm up a bit. For the sticks, I used white lollipop sticks but you could also use wood popsicle sticks or even candy canes. 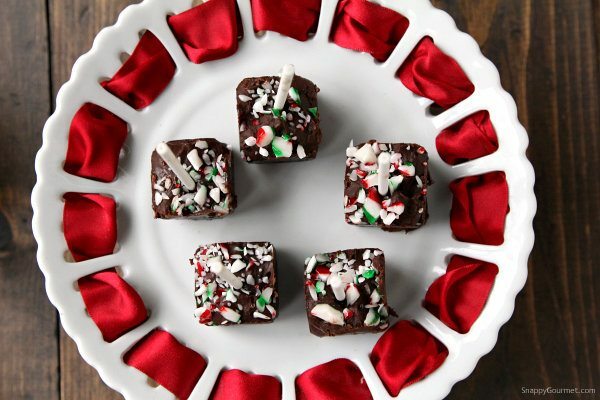 After you put the chocolate in the silicone ice cube trays, you can top each cube with crushed candy such as candy canes, or chocolate chips, mini marshmallows, or anything else you can think of. I used crushed peppermint candy canes but so may options! Place the tray in the refrigerator for about 2-4 hours or until the chocolate is firm. You can also place the tray in the freezer to expedite. Since the silicone tray can be a little flimsy, I placed my silicone tray on a small cookie sheet before placing in the refrigerator. That made it a lot easier putting the ice cube tray in and taking out of the fridge. After a few hours when the chocolate is firm, you should be able to bend the tray a little to get the chocolate cubes to pop right out. 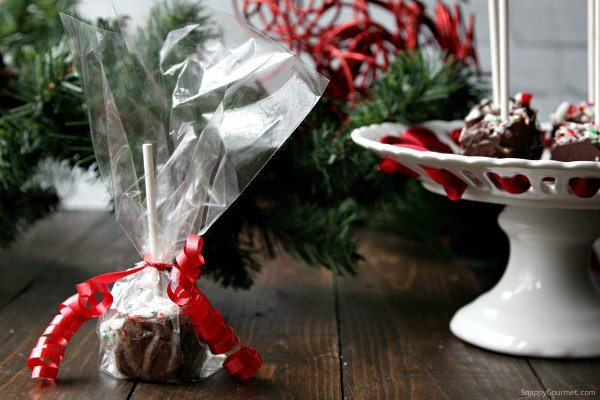 Giving these DIY Hot Chocolate On A Stick as a gift? Place the chocolate cubes in small bags and tie with ribbon. If the chocolate cubes are a little sticky you can also roll or dip them in unsweetened cocoa powder to get them in the bags a little easier. To make the Hot Chocolate, heat up about 6 ounces of milk in a mug and stir with a chocolate cube for a few minutes until melted. Top with some whipped cream and crushed candy or marshmallows, chocolate chips, etc. for a fun drink. You could also use a milk alternative such as almond or coconut milk. I strongly recommend NOT substituting water for the milk though. It will be horrible. haha! 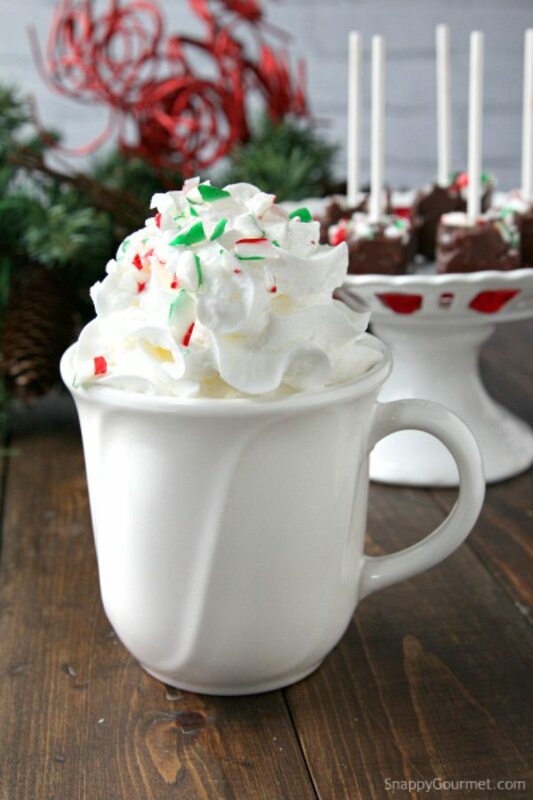 Make a variety of different flavors and make a fun Hot Chocolate bar for a party. Kids would love it! Perfect for New Year’s Eve too! Happy Holidays friends! 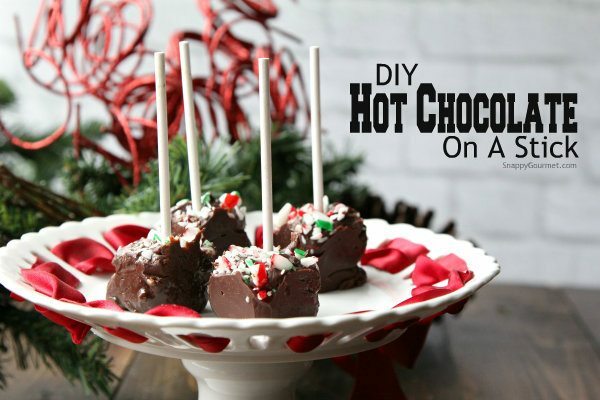 Hope you enjoy this Hot Chocolate On A Stick recipe! 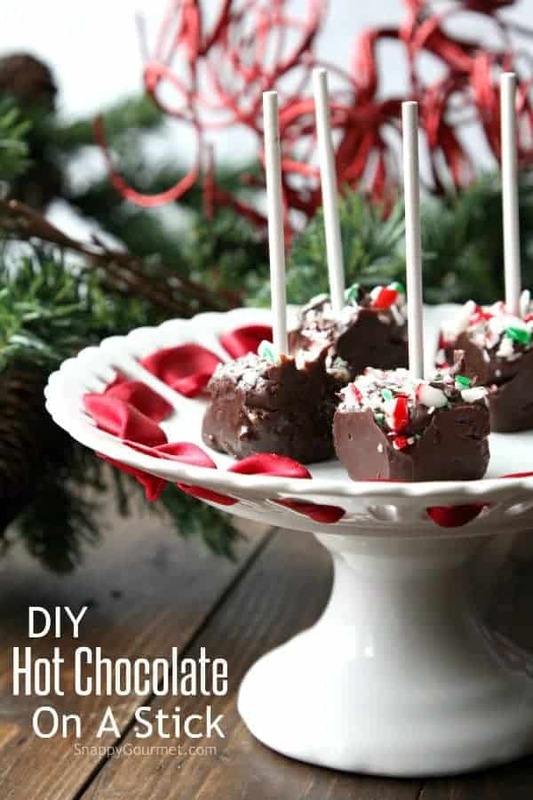 DIY Hot Chocolate On a Stick, an easy recipe to make chocolate cubes for hot chocolate! Toppings (optional): crushed candy canes, crushed candy, mini chocolate chips, mini marshmallows, etc. Place cream and milk in a small microwave safe bowl. Microwave on high until hot and bubbly, about 30 to 60 seconds. Pour hot cream and milk, over chocolate chips in a medium sized mixing bowl. Stir until smooth. Place a silicone ice cube tray on a small cookie sheet. Spoon chocolate mixture into each cube of the ice cube tray. Place a stick in each chocolate cube.Top with your favorite toppings as desired. Place tray in refrigerator for 2-4 hours or until chocolate is firm. Bend silicone tray carefully to pop out chocolate cubes. To make hot chocolate, stir in one Hot Chocolate On A Stick in about 6 ounces of hot milk until chocolate has melted. SNAPPY TIPS: Be sure to use a silicone ice cube tray (I used a 1-inch cube tray) rather than plastic so that the chocolate pops right out when done. You can also add extracts and flavoring to the chocolate but be careful that the flavorings don't cause the chocolate to seize. SNAPPY SUBSTITUTIONS: Instead of semi-sweet chocolate chips, you could also use dark chocolate, milk chocolate, or bittersweet chocolate. Instead of lollipop sticks you could also use candy canes or popsicle sticks. Help! I did (or thought I did) exactly as the recipe instructed and my chocolate is gooey and won’t pop out of the silicone tray – even over night in the refrigerator. Oh no, so sorry to hear that! Not sure what went wrong but I’d try sticking them in the freezer for a few hours. Well, If I had to guess, I would say a few weeks or probably much longer if in the refrigerator or freezer. Of course depends on how old your ingredients are as well. Be careful of any candy you put on top such as crushed candy canes. Sometimes they can start to not look very good after a while.